After writing yesterday’s post I got a message from the “new friend.” She is the one on the right in the photo above. I am the one on the left. My two childhood friends are in the middle. The new friend’s name, Amie, will be familiar to regular readers on this platform. After reading my post yesterday she sent me these three old photos. Above is at the top of the gorge, just as the sun is coming over the mountain. Dawn’s rosy tipped finger, someone among us surely said. By late morning, time for a fruit break, below is the place where I might have started thinking of stacking stones, in the figurative sense of wishing something of the future. But I did not then, nor do I now, believe in totemic powers of objects, or good luck. I believed that a new friendship was sufficient good fortune, and being in that natural setting was the closest I got to worshiping things. No need to stack stones. As we made our way down to the bottom of the gorge, to where those sky-high rock walls allowed single file passage to the black stone beach, conversation was the thing. The black stones were a surprise because they seemed to bear no relationship with the geology of the gorge. And I do remember now, playing with the stones, and surely stacking them while we sat there looking out to the sea, continuing the conversation. But I was not stacking stones in the way Sophie Haigney’s story refers to. Really. I can say that with confidence because Amie reminds me that the oblong oval-shaped stones were not stackable. So I tried my best, but could not get one to rest upon another. That said, I am also confident that while not superstitious I was still able to make wishes, and then take actions to fulfill them. On the island of Crete, we left Xania well before sunrise to hike from the top to the bottom of Samaria Gorge, as far south in Greece as you can get and still be on land. With every switchback of our descent, I was getting more and more lost in conversation with our new friend, so that by the time we reached the bottom of the gorge I wondered where the day had gone. After a full day of hiking, lost in conversation or otherwise, the stones of the gorge play on your mind. At this point you pass through one last formation that is so stunning that if you had not been thinking of playing with stones until now, you had not been paying enough attention. And that was my case. I remember walking silently through this last section and not talking again until the very end, when you spill onto a beach formed by smooth black stones, facing south, nothing but water until you reach Africa. There, in Agia Roumeli, you can get a cool drink before a boat takes you back to Xania. And while you wait for the boat, if you have something to wish for, you may find yourself stacking those smooth black stones. From his balcony above Marseille’s port, Jean-Pierre Eyraud has a prime view of the giant, luxury cruise liners that dock in the city bringing 1.5 million passengers a year. But since Eyraud was diagnosed four years ago with throat cancer – a diagnosis several others in his neighbourhood by the port have also had – he watches with a sense of dread as the floating holiday palaces drop off day-trippers. He and environmental campaigners fear the air pollution caused by cruise ships burning fuel all day at port is choking Marseille’s citizens along the coast. The name “Jabiru” is derived from the Tupi–Guarani family of languages from South America and means “swollen neck”; an apt description. This is the tallest flying bird in South and Central America and is second in wingspan (excluding pelagic flyers like albatross) only to the Andean Condor. This denizen of wetland habitats is a voracious, opportunistic forager on a wide variety of animal matter, living or dead. Needless to say, an impressive bird and I was ecstatic to see it! When I decided to delete that app it was without hesitation. I wanted to avoid sanctimony, but the point of making a show of my resolve was a simple message, i.e. that manners matter. Even though that app had been extremely useful to me over the past year, it was not so useful that I could ignore its founder’s behavior once I finally paid attention. Hi, there! I’m Mari Gray, founder of artisan-made brand Kakaw Designs, based in Guatemala. After studying International Relations and Spanish at UC Davis and then working for several non-profits in Latin America, I became disillusioned and decided to focus on sustainable development through a social enterprise, partnering with talented artisan communities in Guatemala. I feel incredibly fortunate to work with different artisan groups in Guatemala through Kakaw Designs (pronounced <kekao> like the cacao tree), an artisan-made brand I started about four years ago. We currently work with several different artisan groups: two weaving, one embroidery, two teams of leathersmiths, and one silversmith; all to make our designs come to life. But it was for a good reason that we started with the weaving cooperative Corazón del Lago in San Juan la Laguna, at Lake Atitlán. 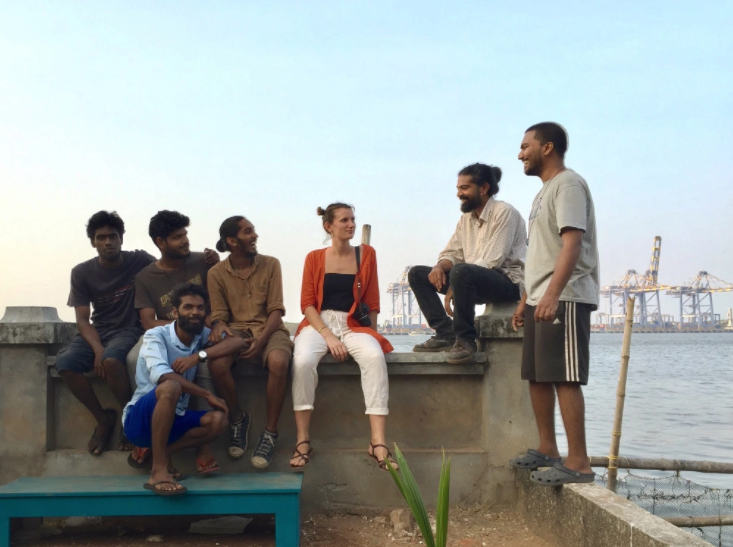 Myself and the Kochi-Muziris Biennale volunteers of The Pepper House. I often struggle to formulate the words to describe transformative experiences. But now, looking at the film I developed from my month in India, waves of nostalgia and inspiration flutter to me. This post is the India I felt, saw, and loved for 30 days. I have been fascinated by India since I was four years old, when my preschool teacher brought Sri Lankan rice and curry to class. The sensation of spicy food and description of spice plantations soaked deeply into my curious brain. Throughout my childhood I researched India, and fell even deeper in love, imagining my own body amidst the color and chaos. It was not until I arrived in college (this year), that I would have sufficient time for my first trip to India. Yesterday in these pages we welcomed you to visit the new website for and the actual place, Chan Chich Lodge. It bears repeating. This time by me personally. Please come here. The snapshot to the right, taken on my phone just minutes ago on my morning walk, says the same. If you combine it with the last time I was walking these paths, you will see one more reason why I walk every morning. I walk the roads and paths at Chan Chich every morning with the hope of seeing wildlife, and knowing that breathing the air here is better than doing so almost anywhere else on the planet. It is pure. Between the puma-sighting snapshot and now I was in India. I have just arrived to Belize again and expect to be here for some time. I did not see any big cats this morning, but the birdlife is as abundant as ever, and their song just now provides very good cheer. If you need more information on why to come to Chan Chich, or how, or when, just let me know. Adaptable, intelligently put together, responsive to local conditions and able and willing to travel almost anywhere with ease – but enough about you, we’re here to tell you about mobitecture. What’s mobitecture we hear you ask? Well it’s mobile architecture and Mobitecture is the name we’ve smartly bestowed on it in our latest book. Our journey began with a PASSION FOR HEALTHY EATING instilled by our Eastern Mediterranean heritage. As the family grew, home cooking revolved around grilling and roasting ingredients that are full of goodness, avoiding deep frying or saturated fats. This post from yesterday reminds me of an early morning walk I took a few days ago with Seth and Jocelyn, when these two donkeys came wandering down the road. One seemed determined to get his head and shoulders portrait in the best possible light. So I indulged him, and both seemed happy with a bit of nose-petting. No carrots, but never mind. When we continued our walk they started to follow, but then, nope. They wandered off in the opposite direction.